Facilities available at Tonto Natural Bridge State Park. Sorry, pets are not allowed on the trails at this park. One may see the Natural Bridge from four different parking lot viewpoints without hiking down to the bottom. The Tonto Natural Bridge Visitor Center inside historic Goodfellow Lodge offers information and a park store. The Goodfellow Lodge is available for groups to reserve! Learn more! Visitor Center hours: 8 a.m. - 5 p.m.
We have a variety of books for sale about the region and the area. We also sell snacks, water, soda, walking sticks, and T-shirts. Hours 8am - 5pm. Interpretive exhibits located within the Lodge include artifacts on the history of Tonto Natural Bridge, plus information about travertine, prehistoric inhabitants, and the historic Tonto Lodge. Photographs and a painting of the Natural Bridge with a scenic slideshow are also available to visitors. Day-use ramada reservation can be made by calling the park directly. The cost to reserve it is $40.00 plus a $5.00 non-refundable reservation fee. New Group Ramada: 20x40’ ramada with tables and grills. Please contact the park for ramada reservation information (fees apply). Cypress Group Ramada: 20x30 ramada with picnic tables and BBQ grills available on a first-come, first served basis. 10x10 Ramadas: Three ramadas with a picnic table and BBQ grill are available on a first-come, first served basis. No reservations. 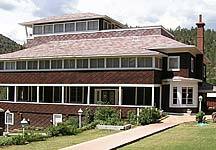 Lodge: Goodfellow Historic Lodge is a historic lodge built in 1927 and has 10 bedrooms and communal restrooms. Our lodge is like your home, which means it has a kitchen, beds, and restrooms. We provide the essentials you need to cook with, and the utensils you need to eat and drink. We look forward to having you reserve your stay with us at Tonto Natural Bridge State Park. To inquire or reserve, please call (928) 476-4202. Lodge Dining Room: Rustic wood setting, family style dining environment with bench-style seating. Kitchen: Our kitchens are supplied with the following types of items for cooking and service of meals: Cooking items, such as pots and pans; Utensils such as tongs, spatulas, and ladles; Meal service items, including china, glassware, and silverware. In addition to the basic cooking and service items noted above, some specialty use items are stocked in our Lodge. We suggest that if you intend on doing any cooking or baking other than basic meal preparation and service during your stay, that you bring those items along. Goodfellow Lawn: There is a large open lawn great for small parties or weddings. There is a wood BBQ or two propane grills available to rent. Roosevelt Suite (ADA): The suite is available for group overnight rental. The suite has a restroom and shower, a vanity/makeup desk, a small refrigerator, microwave, and kitchen counter with cabinets. Many unsheltered picnic tables are located throughout the park for your enjoyment. Swimming is not allowed under the Natural Bridge. However, you may swim downstream in Pine Creek. Please be advised there is no lifeguard on duty. Swimming is at your own risk. Many different birds species visit the park. Please ask for a park bird list when paying your fee at the entrance station. Deer, rabbits, and javelina also inhabit the park. Help us protect this unique feature for generations to come. 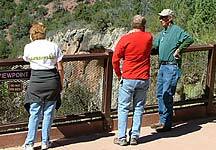 Please follow all park rules when visiting Tonto Natural Bridge State Park. Note: There is no public telephone, cell phones signals, or internet access at the park. Littering is unlawful; tossing your cigarette butts on the ground is littering. High Fire Danger occurs every summer; during these times, smoking is restricted to the parking lots and charcoal fires are prohibited while propane stoves are okay. Pets are allowed on the park but we suggest leaving them at home. If you bring a pet, you are restricted to parking level and viewpoints and they must be kept on a six foot controlled leash at all times; Pets are not allowed on park trails. Pets cannot be left unattended during your visit. Rock throwing is not allowed on the park and take care while hiking down the trails as rock may fall naturally from the steep cliffs above. Swimming and wading is prohibited under the Natural Bridge; passive water play is available upstream and downstream from the Bridge. The Park possesses numerous natural hazards; please use caution while visiting the park. No glass containers on the trails. Good shoes, with ankle support are ideal. Flip-flops, sandals, and high heels are not good shoes to wear at Tonto Natural Bridge. Two liters of water per person are highly recommended: one for the way down and one for the way back.